Spin the Wheel of Value! How do you talk about the value of volunteering? And, with whom do you discuss it? So many professionals strive to make the case to organizational leaders to invest in engagement through financial resources, staff time, space in the facilities, and equipment or training. Others seek to educate funders about the value of investing in volunteer engagement by articulating how engagement directly enhances mission-fulfillment. Local governments are exploring how an engaged citizenry strengthens their community, as well. For years, the field was focused on measuring impact simply by counting hours. Thankfully, the conversation has advanced immensely beyond that metric alone – which focused only in input rather than outcome. However, the topic is complex. 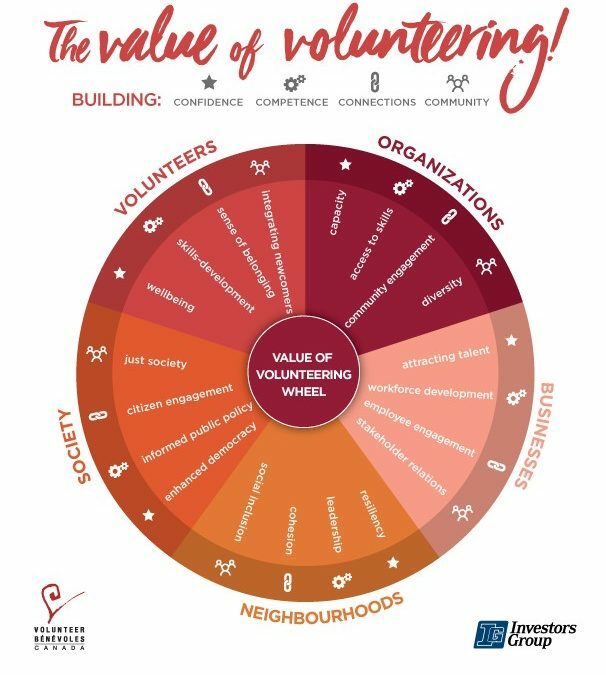 Never had we seen a clear and broad way to knit together the multifaceted benefits until this new tool was released recently by Volunteer Canada – the Value of Volunteering Wheel. Volunteer Canada, the organization that provides national leadership and expertise on volunteerism to increase participation, quality, and diversity of volunteer experiences across Canada, has developed this tool to fuel conversation, thought, and research around the issue of volunteering value. Additionally, across each of those groups, volunteering builds Confidence, Competence, Connections, and Community. As you can see, the wheel features benefits for each measure (Confidence, Competence, Connections, and Community) across all the audiences. For example, among volunteers, competence is built through skills-development, while neighborhoods build competence through leadership. For businesses, connections are developed through employee engagement, whereas organizations encourage connection-building through community engagement. The wheel itself is a valuable model, but there’s even more embedded into each spoke. The wheel is, in fact, “three-dimensional” in that each spoke of the wheel links to a dynamic list of resources, research, and tools. To learn more about how volunteer engagement helps businesses attract talent, you can click on that concept and you’ll be directed to research in this area. Volunteer Canada seeks to maintain a dynamic and growing set of resources and invites others to share additional resources and tools. So, take the wheel for a spin in your engagement efforts. Here are a few suggestions. Use the wheel to frame a case statement to potential funders. Share the wheel in a leadership meeting and explore how engagement is being leveraged to reap these benefits. Are there ways you can enhance benefits by being more strategic and intentional? Strike up a task force to review and assess your current evaluation processes and identify areas where you can capture evidence of impacts and benefits from across the wheel. Convene your local DOVIA, AVA, or engagement roundtable and use this as the basis of a discussion forum.